Ulm, a city in Baden-Württemberg with a population of roughly 120,000, has many worthwhile cultural sights. One of its more unexpected and especially delightful sights is its Museum of Bread Culture on the northern edge of the Old City. In 1955, Willy Eiselen (1896-1981) established the museum and, along with his son Hermann Eiselen (1926-2009), promoted the museum not only throughout Germany, but also worldwide. The Eiselen family provided supplies, equipment, and provisions to the bakery trade and felt an understandably strong allegiance to the craft and trade of which they had been a part for so many decades. The first exhibits opened in 1960 and the museum has grown considerably in the last 56 years. Its one-millionth visitor passed through its doors in 2004 and it is now administered by the Eiselen (charitable) Foundation. The museum has more than 18,000 public-collection objects, of which 700 are on permanent display, supported by a rotating display of selected stored items to keep the exhibits as fresh as your daily “Brötchen.” Displays include advances in bread making over the past 6 centuries and underscore the cultural, social, and religious significance of bread. The museum also boasts of a comprehensive, bread-oriented library of more than 6,000 books. One thing you will not find in the museum is even a crumb of bread. Why? Because, from its inception, the Eiselen family and the museum administrators have wisely held that bread is not an exhibit, but a food to be baked and eaten fresh daily. While the museum proudly claims to dedicate itself to the “. . . 6,000-year history of bread,” the fact is that the history of bread can be dated from more than 12,000 years ago; however, I assure you that, regardless of the history of bread, when Germans perfected “Bauernbrot,” i.e., coarse rye or farmhouse bread, it reached its apotheosis, for “Bauernbrot” is perfection itself. Along the way, there were many, many various grains and techniques used by cultures throughout history to make bread. The history of bread with all its intrinsic characteristics begins with grains, i.e., cereals, which ancient peoples ground carefully to make flour. The museum covers this and all aspects of bread and bread making in detail on the first floor. 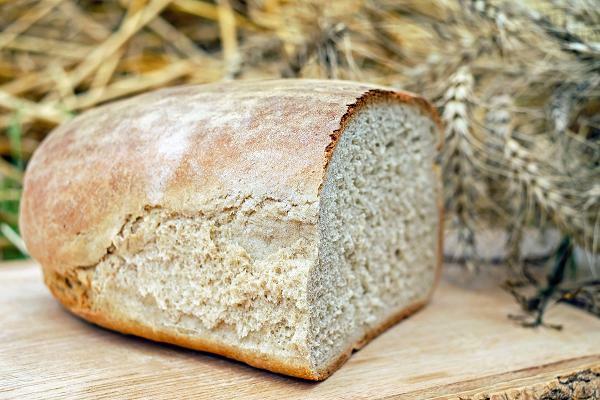 In the process, grains such as maize (corn), barley, millet, buckwheat—none of which contained sufficient gluten to create raised bread—wheat, and rye. The well-known flat breads of various cultures came about because of the lack of gluten in the grains used, while the raised breads came about through grains which contained sufficient gluten to generate the gas (CO2) needed to inflate the gluten-rich dough. To promote such gases, savvy bakers use leavens, e.g., natural leavens (yeast) and chemical leavens (baking powder, baking soda, etc.). These are the most popular leavens, but there are certainly several more which provide specific and unique characteristics to the breads for which they’re used. The second floor of the museum deals with the extrinsic aspects of bread. Civilizations and cultures have progressed through history side-by-side with bread. Bread’s only rival as a necessity of life is water, which is itself an essential part of bread. When we realize that bread and water are requisites for life, it should be no surprise to find that both are linked inextricably to religious beliefs, ceremonies, and rituals. Of course, the absence of bread in a culture or civilization is just as significant as its presence; the absence of bread means famine. Without a good harvest, in the wake of wars, and in the aftermath of natural disasters such as floods earthquakes, hurricanes, locusts, fires, wars, and plagues, there is soon no bread. People starve. As Jonathan Swift said in A Tail of a Tub, “Bread is the staff of life.” Who could argue with that? A significant display by such artists such as Markus Lüpertz, Salvador Dali, Käthe Kollwitz, Franz Francken, Pablo, Picasso, Georg Flegel, Max Beckmann, Man Ray, and Ernst Barlach includes magnificent representations of bread throughout the ages. If there were ever a commodity that meant the same thing to all people, regardless of culture or religion, it is bread. First, of course, bread is a food; indeed, it is the basic food. Beyond that, the word bread stands for all food in many expressions, e.g., “Give us this day our daily bread.” In his Satires, Juvenal observed that the Roman empire had deteriorated to the point that the “. . . people . . . longs eagerly for just two things—bread and circuses!” Shakespeare referred to “. . . the bitter bread of banishment” in The Tragedy of King Richard the Second. Esau sold his inheritance for bread and stew. The author of The Rubáiyát of Omar Khayyám could not be happy with his life if he could not have a loaf of bread along with the company of his sweetheart. Marie Antoinette allegedly lost her life by sneering at the plight of the commoners who had no bread. “Let them eat cake,” she callously crowed. A common English expression is “dough,” i.e., unbaked bread. This slang term hasn’t yet migrated to German as far as I can tell, but I suspect it’s only a matter of time. Bread was also a lifesaver in a quite literal way. In ancient Egypt, physicians applied poultices of moldy bread to infected wounds. In the early 17th century, wet bread was mixed with spider webs to treat wounds. And, while the development was not sparked by bread, it is based on a mold much like the bread molds used by the ancient Egyptians and the medieval Poles.